In my articles Online courses must die! and The ILE and the FLE in harmony, I advocate the development of a virtual Informal Learning Environment (ILE) to work in tandem with the Formal Learning Environment (FLE) to support both the learning process and its administration. Heeding the advice of Bill Brandon, I will now flesh out that idea with an illustration of how it might be implemented in a real organisation. I believe in the power of informal learning. In fact, I go so far as to say it should be the central philosophy of the organisation’s learning model. In a practical sense, that means we need to provide our learners with tools and resources that they can use to drive their own development. This is where the ILE fits in: It’s a space (like a website or intranet site) that centralises those tools and resources. There are a thousand and one possible combinations and permutations of an ILE. However, if I were to consider (read “fantasise”) a greenfield opportunity (read “pipedream”), what would I design? Essentially I would base my design on three core components, as illustrated in Figure 1. The primary component of my ILE is a comprehensive wiki. In a big corporation like the one I work for, knowledge is distributed everywhere – on obscure intranet pages, in random folders, in people’s heads – which makes it really hard to find. A wiki enables the organisation to centralise that collateral, whether directly (by inputting it) or indirectly (by linking to where it exists elsewhere), thereby functioning as the first port of call. A wiki can contain – or point to – all manner of media, such as text, graphics, documents and multimedia. The learner can search and explore the content that’s relevant to them, just-in-time if need be. The flexibility of a wiki also allows anyone to contribute content. This empowers the learner to share their knowledge with their colleagues, build on the knowledge that has already been contributed by others, and communally keep it up to date. The secondary component of my ILE is an open discussion forum. I say “secondary” because my rationale is that, if the learner can’t find the knowledge they need in the wiki, they can crowdsource it via the forum. A discussion forum enables the learner to post a question to their peers, thereby leveraging the collective intelligence of the organisation. Of course the learner can also share their knowledge by answering someone else’s question, and they can learn incidentally by reading the questions and answers of others. The questions posted to the forum may also serve to expose knowledge deficiencies in the organisation, which can be remedied by updating the wiki! The tertiary component of my ILE is a bank of personal profiles. I say “tertiary” because my rationale is that, if the learner can’t find the knowledge they need in the wiki nor via the discussion forum, they can target an SME directly. For example, if the learner is struggling with a Java programming problem, they can look up a Java expert in the system and send them a direct message. The SME may be recognised as a “Java” SME because they have said so in their profile, or – if the technology is sophisticated enough – their contributions of Java-related content in the wiki and participation in Java-related conversations on the discussion forum flag them as such. I’m in two minds as to whether a full-blown social network is useful for internal learning purposes. Apart from profiling, I’m not convinced that friending, status updating and other Facebook-like activities add much value – especially when a discussion forum that accommodates groups is already in place. Self-directed, informal learning is great. However, there are some things your employer must know that you know. The most obvious example is compliance, eg privacy, trade practices and OH&S. If you breach the regulations, the company will be in hot water, so they’re not just going to take your word for it. There are plenty of other examples, such as a certain level of product knowledge, that may be critical to the role. In a practical sense, this means we should map required competencies to each role and assess the employee’s proficiency against each one. That probably leads to a development plan, which in turn forms a subset of the performance agreement and is subject to regular appraisals. Then there are formal training events like courses and workshops that are important and require documentation, and some people want their informal learning (eg reading a book) recorded too. The FLE is a space (like a database or platform) in which all this administration is done. Again, there are a thousand and one possible combinations and permutations of an FLE. However I base my design on two core components, as illustrated in Figure 2. The primary component of my FLE is a Learning Management System (LMS). The LMS is an oft-derided yet invaluable educational technology. I suspect the typical organisation under appreciates it because it uses it illogically. My advice is to use the LMS for what it’s designed for: managing learning. Competency maps, auto-marked assessments, registrations, completion statuses, grades, transcripts, performance agreements and performance appraisals are what the LMS does well. 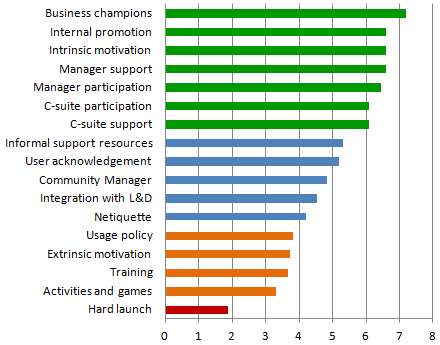 Some even extend into talent management and other HR domains. Conversely, my advice is to avoid using the LMS for what it is not really designed for: managing content. Leave that to the ILE, which is a much more open and flexible environment, and is purpose built to support “learning”. The complementary component of my FLE is the range of reports that can be generated from various systems to provide useful data. Such data may include productivity statistics, quality scores, complaint volumes, engagement indices… whatever can be analysed to identify training needs and/or evaluate learning outcomes. At the end of the day, learning must support performance. The former supports the process of learning; the latter supports its management. Separating the two environments like this aids in segregating them in the human mind. Because learning should be a joy. By definition, an ILE should be unforced, unscored, unthreatening. It should be a safe, open space where people are excited to go because they want to learn, without the burden of forced navigation and pass marks. Simultaneously, an FLE should focus on what really matters. 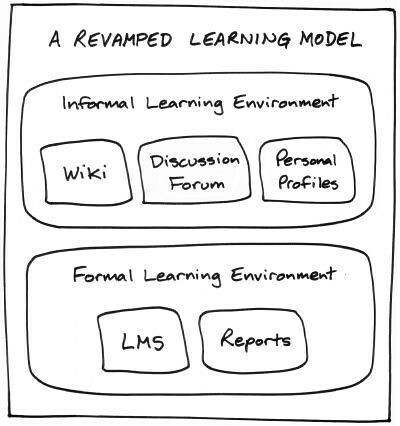 Too often when formal and informal learning are mixed, goals blur and we run the risk of formalising for formalising’s sake. We don’t need to monitor our colleagues like Big Brother; we just need to assess them when necessary. Of course, many more components may be reasonably argued for inclusion in the learning model. An onsite classroom, for example, is obviously a part of the formal learning environment. So too is a university campus on the other side of town. In terms of informal learning, the water cooler, a cabinet of books – and even the pages in a book – may be considered components of the ILE. How about a library of online courses? That might be considered a component of the ILE if the learner is free to explore it at their convenience, but it will suddenly revert to the FLE if the learner is instructed to complete a particular course. Clearly then, the ILE and the FLE are elastic concepts, highly dependent on perspective and context. That’s why I have focused on the core components that I think can provide a universal framework for a revamped learning model. The two virtual environments are constant; everything else around them is variable.